I’ve been driving past this place for well over a year and never even knew it existed. One day while running short on time I did a quick search on what was close by for lunch. This little place popped up with a lot of good reviews. Knowing the area, a little bit I was somewhat skeptical. Don’t let the first impression scare you away. The little plaza doesn’t appear to be the cleanest and the pan handlers are often out in full force when the weather is nice. (I’ve had them follow me right in on more than one occasion.) Trust me the food is worth it. The area could make you feel a little bit uncomfortable but I haven’t had any problems. 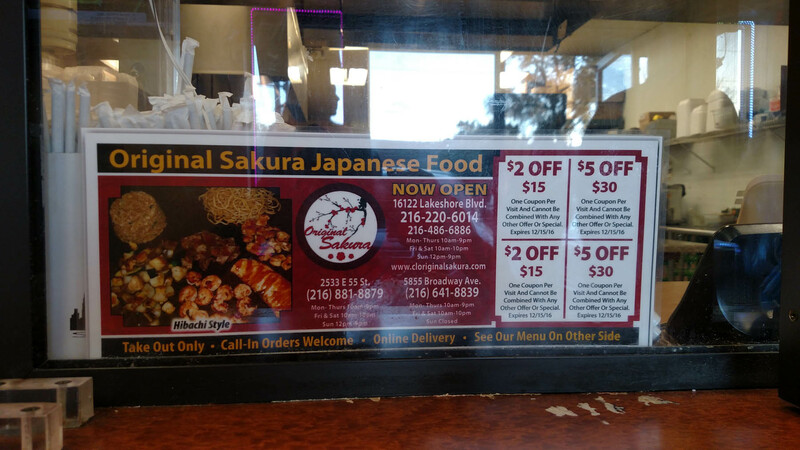 So, Sakura is a takeout only restaurant and the menu is pretty simple and easy to understand. 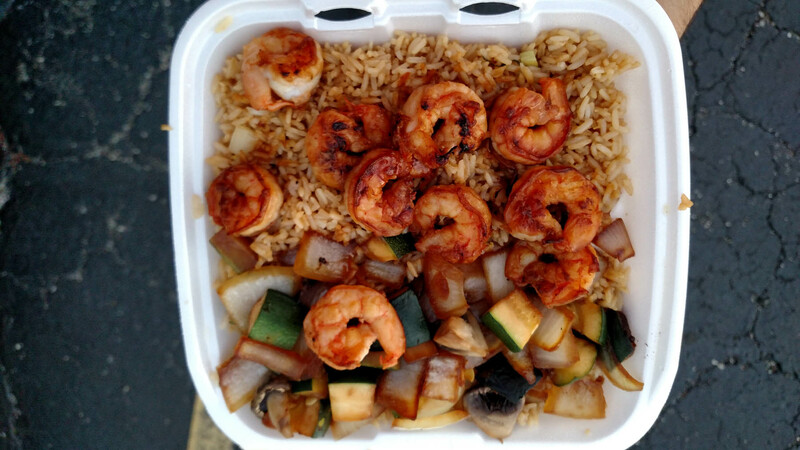 I started off by getting the shrimp and chicken combo with fried rice and vegetables. 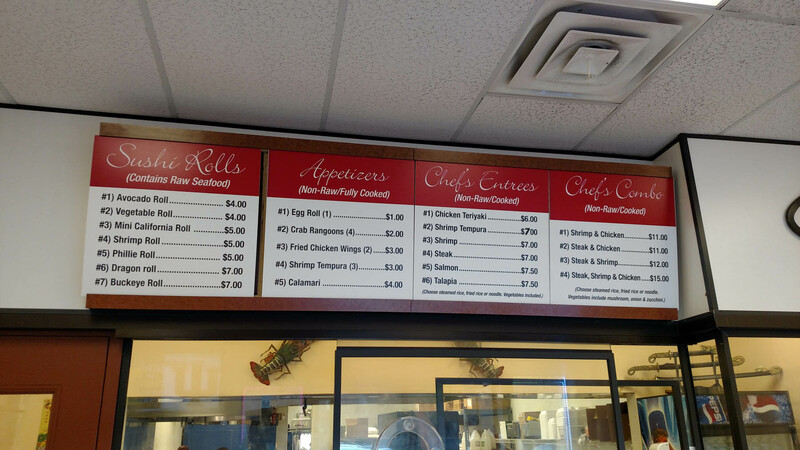 The prices seemed very fair for fresh hibachi style food so I was excited to see how it would be. It was mind blowing!! Easily 2 pounds of food enough fried rice for 3 people and several cups of homemade Yum Yum sauce. The food tasted great and there were leftovers for a second round later that night. I have stopped back at least a half dozen times over the past few months and every time I have been satisfied. I have now switched to just ordering the chicken or shrimp individual meal knowing there is going to be a ton of food in the tray no matter what. The price is amazing the chicken meal is priced in line with most meals at a fast food place and the shrimp is only like $1 more! The prices shown are for it all tax and everything included. That’s right only around $8-$12 out the door for a fresh cooked meal! For the speed, quality, and volume this is one of the best places I have ever stopped. They do have a few other locations listed and I will go check them out to see if they are the same way. I will do an update to my blog post if I do try one of the other spots so keep checking back. 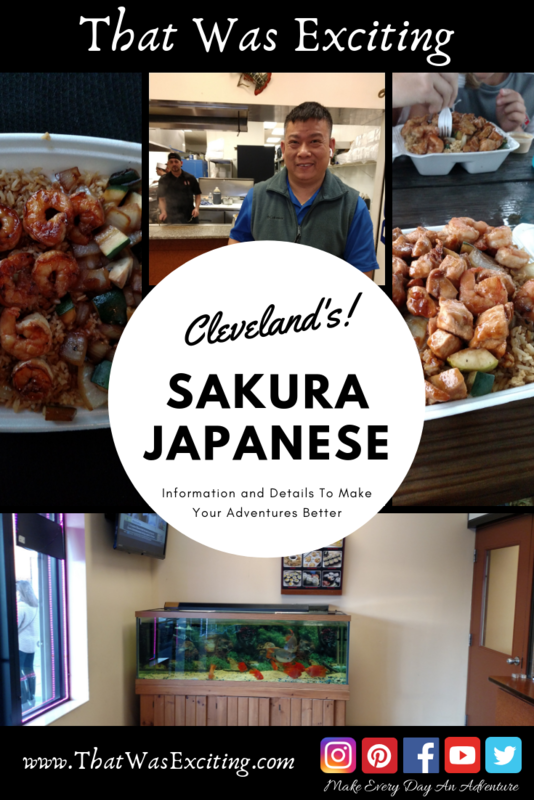 If you find yourself up in Cleveland looking for an adventure, stop into Sakura you won’t be disappointed. Sean’s Tip – If you want chicken and shrimp order them individually. For only $2 more you will get a whole extra tray of fried rice and vegetables. Most meals will feed 2 people so be prepared for leftovers if you go alone. Also, if you call an order in, it only takes them 5 min. so don’t call it in to soon. Come join the fun as I explore my tri-state area and beyond. See my adventures in real time on Facebook and Instagram. Feel free to interact and see what I’m up to for the day. Also check out my YouTube channel for more details and information about my adventures. By following along with my Pinterest posts you will see the Ideas I have for future activities as well as pictures and posts from my previous adventures. I’m so glad you are now part of the adventure. Explore the website for more blog posts, ideas and things that are happening .